The Emmanuel Care Centre in Colombia does so much more than provide homework help and extra tuition for our kids. The educational help is essential for our children to achieve a good education and reach their aspirations, but we know that to truly care for them we must meet all of their individual needs. 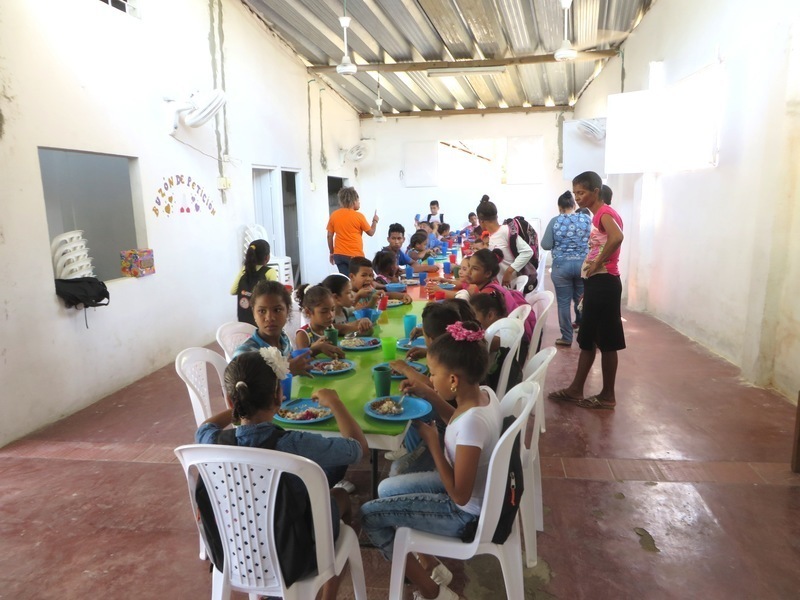 The children who attend our care centre come from the poorest families in Guacamayal, Colombia. For these families, every day is a struggle to put food on the table and provide even the most basic of resources so we provide our kids with regular food, medical care and resources such as clothes, shoes, books, pens and pencils. We go even further and make sure the child’s emotional and psychological needs are met through counselling and support. We provide lunch at our care centre because regular and nutritious food is vital for our children’s health. Without daily food our children would often go hungry, so the lunch they receive each day helps to keep them strong and growing. With belly full of tasty food, the kids can concentrate on their homework and tutoring. Stand by Me has renovated the Emmanuel Care Centre's canteen with the addition of new tables, chairs and table cloths. Now more children can eat their lunch at one time and enjoy sharing a meal together. As part of teaching our children important life skills and responsibility, the children wash their dish, cup and spoon when they have finished their meal. The children happily do this and Stand by Me are seeing children become more caring, confident and interacting better with their peers. Dan took on the Yorkshire Three Peaks Challenge; a trek of 25 miles to climb the three highest peaks in Yorkshire. It is no easy feat and a lot of motivation was needed but Dan was determined to make it to raise vital funds for our kids.